I was in two minds as to whether to write this post but I realised, like all good impartial writers, not everything I post can be a charming, positive story. So here goes... my first [very] critical food review. I was out for dinner with my girlfriends last week. We had intended to visit Nobby’s Arc, a new pizzeria in the aforementioned suburb, but due to popular demand and their no bookings policy (what is with this trend!?) we were unable to get inside the door, thus a backup plan ensued. After a few minutes of debate we found ourselves sitting in Barchino a popular cafe amongst Nobby’s locals (WARNING: If you fall into this category, then perhaps you should stop reading now). We were seated by a cheerful waiter and after ordering our drinks (I wanted Diet Coke, but alas there was only Pepsi – first bad mark) we got to chatting, mind you it was at a significantly higher decibel than usual due to the obnoxious, drunken table next to us. After the table next door managed smashed three glasses the waiter bustled over from dustpan-ing the shattered remnants to take our food order and it all went downhill from there. Three of us had ordered the gnocchi with roasted vegetables and pesto cream sauce. 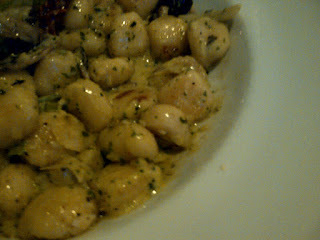 Two came out looking satisfactorily creamy, whilst mine was placed in front of me looking like it was sitting in a puddle of grass-flavoured oil. 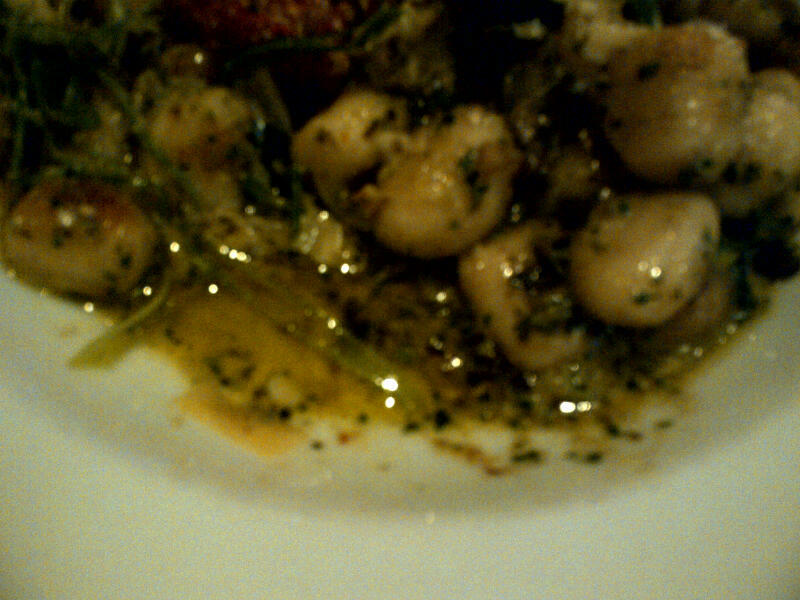 There was absolutely nothing on that plate that could be deemed creamy, expect maybe the stodgy, overcooked gnocchi. In fact, mine looked like it had been cooked in a completely different kitchen (see pictures above). I took a wary bite. After ‘eating with my eyes’ I was no longer very hungry, and it was as bad as I suspected, in fact, worse. All I could taste was oil. Everything on the plate tasted liked it had been soaked in the stuff for weeks. There was no freshness, no crunch of the vegies, it was a turgid, greasy, inedible mess. Now don’t go thinking I’m just extremely picky - I offered a taste to my friend and she agreed, in her words – “oh Krissie, that’s disgusting!” When I told the waiter he offered a replacement (which I declined, no thank you! ), so he then took the meal off the bill. Slight redemption there! Sorry to all the Barchino lovers out there but in this instance I have to give a 0/5. No second chances with me, I won’t be returning. See what I mean? Looks like I’m going to need a rather expendable budget to achieve them all. Here’s hoping for a career with a great salary and some serious holiday time! How many of these are on your Bucket list? There are many things I hope to achieve in life, I am, what you call, a ‘go-getter’. So in a moment of inspiration this morning I found myself writing a Bucket Things to do List. Whilst I am an optimistic person by nature, I’m also very superstitious to the point where you may think I’m bordering on OCD. To me, writing a B_ _ k _ _ List just seemed like tempting fate, let me explain. When I was a child, if I was stressed or worried, I would make deals with fate/god/whoever was up there listening, to prevent bad things from happening. Growing up it was just mum and I, so I would often fret that she would not make it home safe from work. I would wait in the garage and make a deal with myself that if I counted every car coming down the street until she came home, she would be safe. I, of course, would hold up my end of the bargain and inevitably Mum would arrive home. Or, if I was worried about the boogie man coming to get me in the night I would type my conversations to him in my head, telling him to stay away – of course, he never appeared. Logically I know these things don’t help, but to me it’s as though not doing them will ensure something bad WILL happen. It seems to me that things always go wrong when you are not expecting them, so I tell myself to expect every possible bad thing that COULD happen, to comfort myself that it won’t. Driving to work I think: I could be in an accident, I could get a speeding ticket, my car could be scratched in the carpark… yet none of these things occur. But enough of my silly ramblings. If you are reading this and are one to have your fair share of bad luck perhaps you should consider my advice, but if you are one of the lucky ones, feel free to continue about your day. I’m going back to my Bucket Things to do List, I’ll be sure to share some of my favourites with you soon! 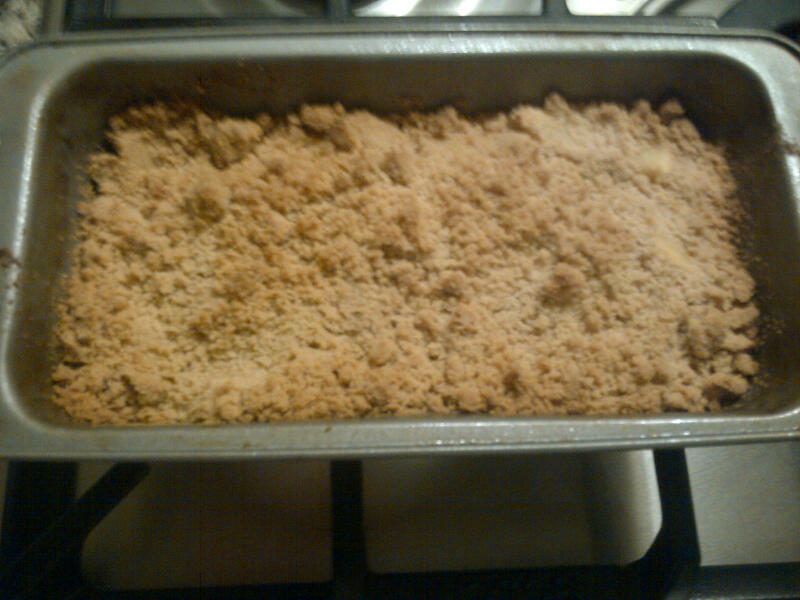 Ah the humble apple crumble, such a deliciously simple, rustic recipe. I’ll admit, I’m probably more of an apple pie lover, however this is such a great alternative when you don’t want to be fiddling with pastry. Plus it’s more than likely you will have all these ingredients in your pantry already, so why not make it for tonight’s dessert? 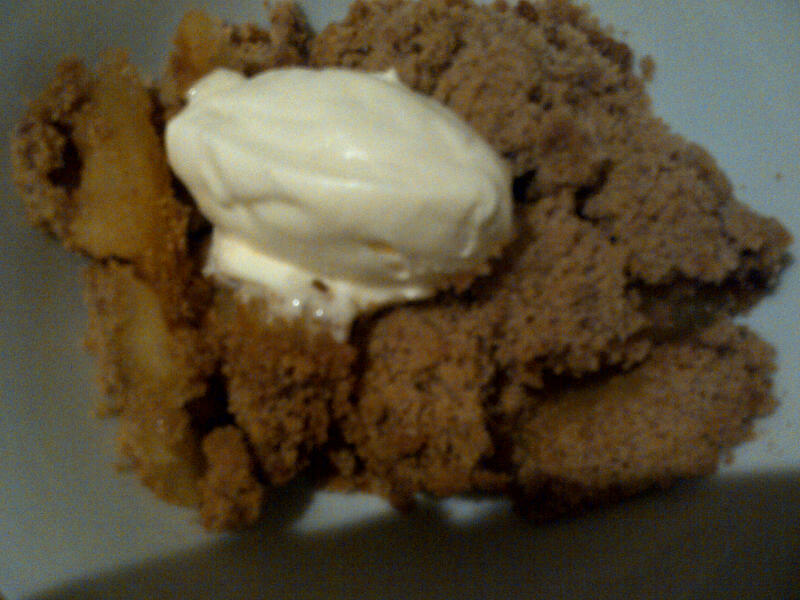 Serve with a dollop of cream or ice-cream, yum! Serves 4. Preheat oven to 180 degrees Celsius. Grease a baking dish. Peel, core and slice apples. Cook apples with sugar and water in a large saucepan over low heat, covered for about 10 minutes. Drain, and discard liquid. 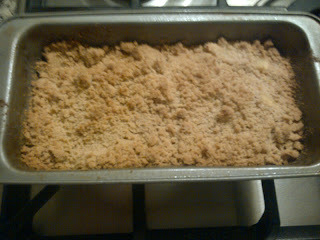 Meanwhile, make crumble. Blend or process flours, sugar, coconut, oats, butter and cinnamon until combined. Spoon apple into dish and sprinkle with crumble. Bake for about 25 minutes. Gorgeous isn't it? But I hear you asking, who needs a $400 cushion?... Well I do. 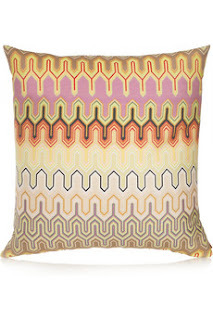 And this isn’t just any cushion, this little accessory is part of Missioni’s home collection and is sure to add a splash of colour to any room. Colours in this pattern range from zingy lime to rich red. Ah, makes me happy just looking at it. Now, I need half a dozen for my lounge, donations anyone? After nearly three years of travelling to uni by train I have had plenty of time to indulge in one of my favourite activities – people watching. Over the years I have seen many things; some made me smile and some made me squirm. I have seen loved up couples with stars in their eyes – naww. 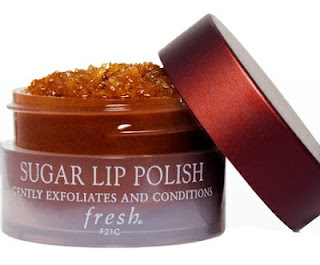 I have seen a man who was covered in scabs and spent the entire trip picking them off and eating them – urgh! 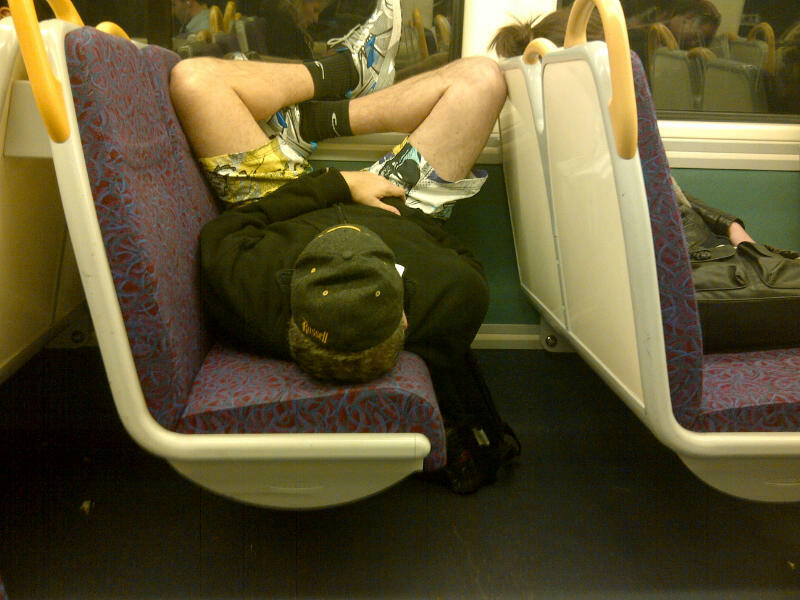 I saw a young fellow who carried out an entire hour conversation with his reflection – definitely giggle worthy, although rather concerning too… And most recently I saw the man pictured above – to me, his sleeping behaviour mimicked that of a jedi/yogi/grasshopper amalgamation. What really gave me a laugh about this man though was not just his position but the way in which he got into it. Using the yellow bars, he hoisted himself up (not unlike a gymnast), pushed off, rotating in midair and flopped down on his back with his legs crossed up the window. It was rather a spectacle. I find people really interesting to watch, so it’s things like this that make these train rides bearable for me. If there is an entertaining character around I have been known to pass the entire hour and ten minute trip by casually observing from beneath my sunglasses. I’ll put my iPod in my ears for show, but if there is an interesting conversation going on I’ll have it on mute. Hey, I spend an average of eight hours a week on public transport, so a girls gotta have some entertainment, right? Movida’s reputation proceeds itself. I have heard about this place so many times over the years that it’s a wonder I had never visited before. Melbourne’s Movida is tapas bar that embraces the essence of Spain. It began with Movida bar de tapas and has now expanded to three restaurants in the city: Movida bar de Tapas, Movida Next Door and Movida Aqui (where I dined). Warning: don’t make my mistake. I thought all three restaurants where in the same place, that is in Hosier Lane across from Federation Square. So there I was at Hosier Lane ready to plonk myself down for some delicious food and it turns out I’m in the wrong place. Movida Aqui is on the other side of the city on Bourke Street, take note! Aqui has a great feel about it as soon as you walk in the door and some fantastic décor, I would describe it as funky meets functional; plenty of wooden surfaces and interesting lights. Aqui is much larger than the other two Movidas but it still retains an intimate feel. We were ushered to our table and the menu was explained to us by a very friendly waiter. It is clear that all of the staff love working there. The food at Movida is purely tapas; lots of finger dishes which you can order singly or in multiples, then there are larger dishes designed to share, as well as paellas, and let’s not forget dessert (more on that later!). My girlfriend and I ordered some individual tapas and then a dish to share. We had the potato bomba, the bocadillo de calamares, the smoked eel brandade and then shared the prawns cooked with chorizo and cider. It was more than enough for us, but considering our booking was at 9.30pm (due to the incredible demand!) we weren’t extremely hungry. Our food came out very quickly but was brought in waves, which is ideal for this style of dining. 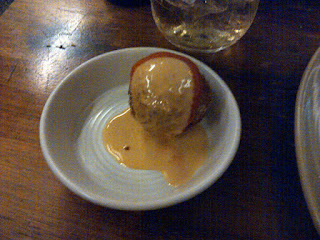 The bomba was a delicious little treat, not unlike an arancini ball except inside it’s filled with potato and chorizo. It was served with a spicy tomato sauce which certainly got my palette dancing. 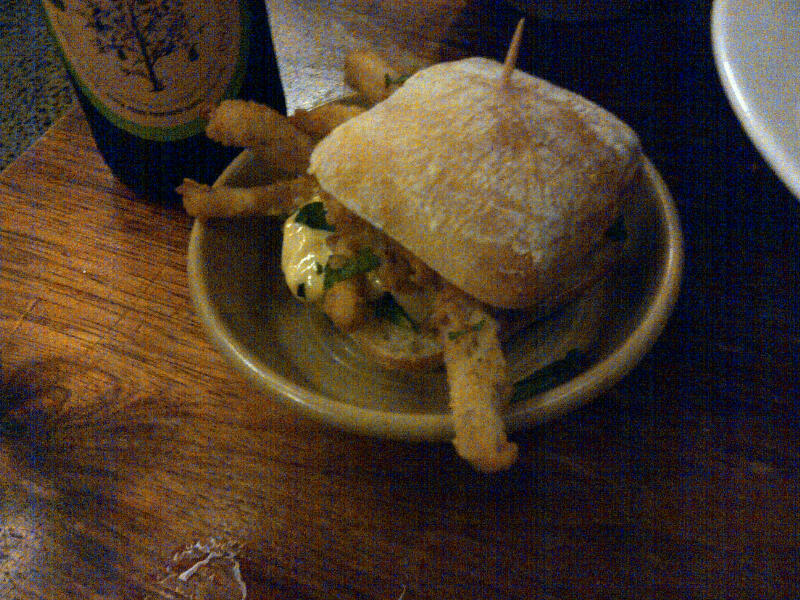 The calamari was also a yummy little treat. It looks like a miniature burger served on a pana di casa style miniature roll. They were a little heavy handed on the sauce for my liking (a garlic aioli) but other than that it was a yummy novel dish. 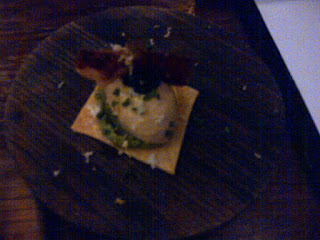 My adventurous friend enjoyed her eel and described it as a subtle smoky seafood flavour. It was served on a pastry square with a quenelle dollop of the eel mouse. I would definitely be keen to try it next time. 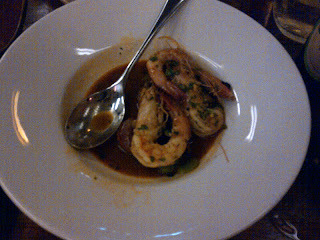 Our prawn dish was also great, the prawn and chorizo is an amazing flavour combination – they set off each other beautifully. You can see the full menu here. Of course, since it was our first time dining at the famous Movida we thought we had better indulge in some dessert. 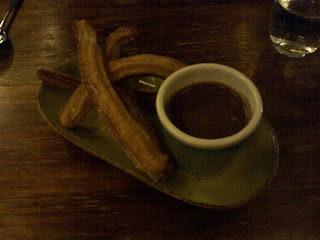 We had the churros with chocolate dipping sauce, and I think it is safe to say that they were the nicest churros I have eaten – light and crisp, rather than stodgy, which they often are. The dipping sauce was a nice compliment, however it tasted as though it was made on cocoa powder rather than chocolate so didn’t quite have the richness I desired. Overall, it was a great food experience. I loved the restaurant, the atmosphere and the food. Once again I have to give a 4/5. I don’t like to buy too many bottled sauces and marinades, the preservatives and additives tend to make me sick. Because of this I have always been one to make my own, and I encourage you to do the same! Most things are easier than you think and I can guarantee they will taste so much better. 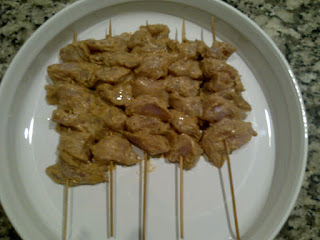 These satay skewers are really delish and so easy to make! Cut your chicken into 2cm cubes and set aside. In a food processor combine chilli, garlic, ginger, peanut butter and soy. Blitz until fairly smooth. Add the juice and zest of the lime and a couple of splashes of water. Whiz until it comes together in a smoothable paste. 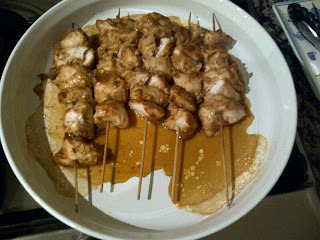 Reserve a little of the satay sauce for later and then coat your chicken in the remainder. Cover and refrigerate overnight. This gives maximum flavour but if you are a little short on time a couple of hours will do. Preheat oven to 170 degrees Celsius. 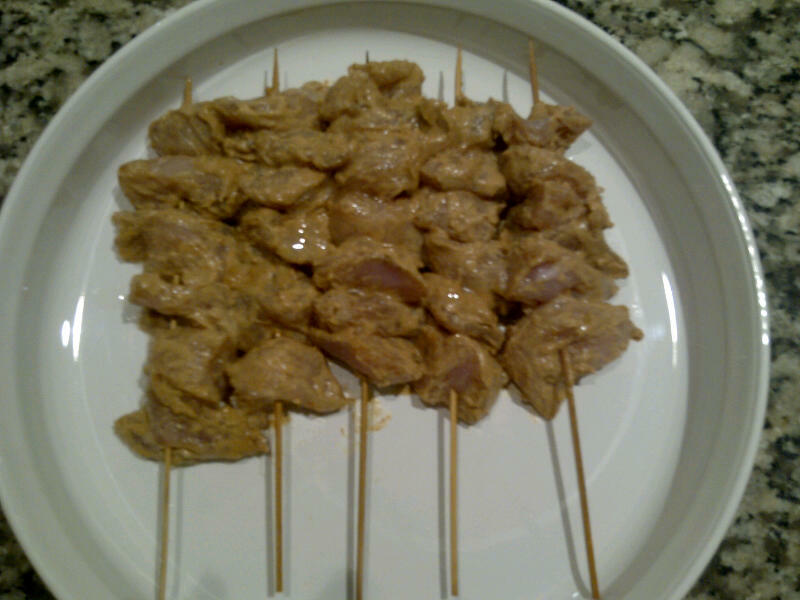 Soak skewers in water for 5minutes before threading on the marinated chicken. Place in a baking tray, drizzle with oil and season with salt. Cook in the oven for 15minutes, turning halfway. Serve with the reserved sauce and your favourite side dish. Life can be really stressful, unless you are one of the lucky few who are blessed with an utterly easy-going view of life – nothing is a worry, “she’ll be right” surfie philosophy. But for the majority of us living can be a rather demanding experience, especially if you are: a uni student (hey, it’s tougher than it sounds), full-time worker, parent, olympian, or, like me, are extremely conscientious. We all know how therapeutic it is to clean out our wardrobes, so why not take the same approach with life in general? - Write lists, dorky I know, but it really is so much easier. If you jot down everything you need to do/remember then the pressure isn’t on your brain to remember, but rather your notepad’s ability to (I’ve been told they are like elephants, they never forget!). - Simplify! If you don’t need to know about it or have it, get rid of it! - Participate in the idea of exchange. For example if you take up a new hobby then let an existing one slide; if you add a new Facebook friend then delete one you’ve lost contact with. Otherwise, ten years down the track you are going to have 5,000 ‘friends’ and how many of them would you actually invite to your birthday party? Maybe 100? Over time we change and evolve; something that was relevant and important to us five years ago, may not be now. - Learn to say no! If you can't get your mouth to form this tiny little word you will end up taking on too much. - Make a plan and set some goals! Even if it’s just for the next day/week/month, and if you’re really adventurous you can do the next 10 years. This will give you something to work towards. Plus when you actually achieve what you set out to do you’ll feel proud! - Finally, if all else fails, identify what is important to you and eliminate everything else. Pretty simple! 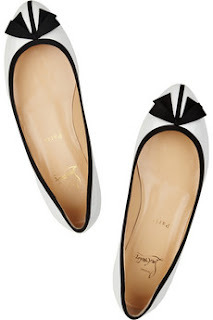 These gorgeous ballet flats scream uber style to me. The black trim contrasts perfectly with the white leather to create a multi-purpose look. Whilst very ‘uptown’ in design, I think these little babies would look great teamed with a casual blazer and jeans to create an effortless ‘downtown’ look. At $600 my budget could potentially stretch this far, but let’s keep it our little secret! Preheat oven to 180C. 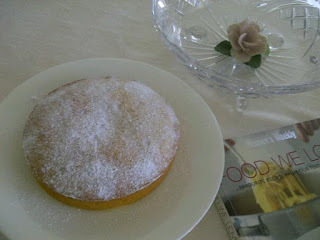 Grease deep 20cm round cake pan and line base with baking paper. Beat butter, sugar, egg and extract until light and creamy; add sifted flour and milk. Stir until smooth. 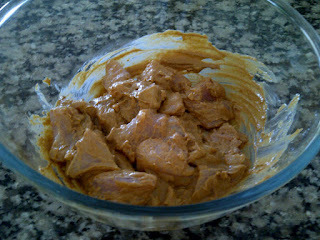 Spread mixture into pan; bake 25minutes. Stand cake in pan for 5minutes before turning onto wire rack. Brush top with extra butter, sprinkle with combined extra sugar and cinnamon. 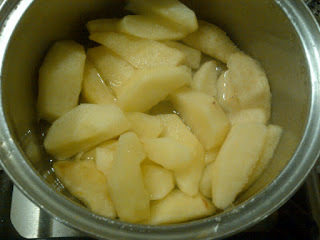 Place apple slices around the top of the mixture once it is in the tin. Add the zest of 1 orange with the flour and milk. I am absolutely fascinated by this gym craze that seems to have swept across the nation. I don’t know about you but I certainly don’t remember such an obsession a few years back. Gyms keep popping up everywhere: on large lots in suburbia, tiny cramped spaces in inner city and in make-shift halls in rural areas. These days it’s easier to find a gym than it is a toilet. Now I’m all for health and fitness – I think it is fantastic that people are taking exercise seriously, but I do think that a lot of you have gone a little mad. What happened to the love-hate relationship we are all supposed to have with exercise? That’s why it amazes me that these gyms are all so busy, all the time. Don’t any of you feel like having a day off? And some exercise is pretty absurd… Stepping inside a Fitness First, the first thing you see is all these people on treadmills. Don’t you realise you’re running nowhere? Wouldn’t you like to see your scenery change as you move? What’s wrong with a jog around the block, in the park or, if you are especially adventurous, on the beach? I was in Sydney at the start of the year for work. Whilst I was there I stayed at a motel in the city and when I looked out my window I had a perfect view into the gym class across the road (I was tempted to join in from my room, but resisted) and I was struck how bizarre it all is. To see 20 people crammed into a tight room trying to mimic the complex movements of the instructor (and for the most part failing, I’m sorry everyone) left me in a fit of giggles. When did we all start taking these classes so seriously? I mean there were people in there who wouldn’t have even wanted to dance at their own wedding, let alone for fun in a stuffy room full of people in front of a mirror. And all this 'checking-in' nonsense has got to stop. "<insert name here> wow great spin class, I just burn 1000 calories!" at Fitness First. We don't care! That's great you're at the gym but go for yourself not for other people's vision of you. I think it's time we stop with this pretentiousness. Exercise if you want, and if not, well then sit back, relax and enjoy that Mars Bar, after all we only live once! I’m not really one to buy into celebrity ‘slashie’ enterprises – singer/actor/model/designer/presenter etc. etc. But I must say Victoria, although never smiling, always looks stylish, which inspired me to check out her clothing range... And I have to say, the jeans look pretty good. 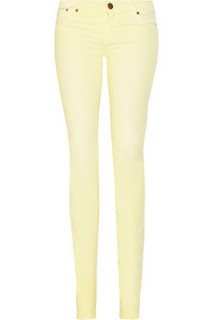 Most of her range features candy cotton, pastel shades, a must have for every girl’s wardrobe. These sorbet-lemons are my fav. $199.